100% Satisfaction Guarantee. WORRY FREE! ORDER NOW! Any problem please feel free to contact us. Unrivalled quality: Our make up Organizer will look just like new even after a long time use due to its durable and waterproof material. It is very suitable for travel, business trip or use at home.Fit in your suitcase About the product * Delicate Looking& Workmanship. The tidy and fine close stitching ensure the Makeup Organizer bags are sturdy and durable. * You can Design Yourself internal compartments by the adjustable padded dividers. * Lightweight & Easy to Carry. Ideal for taking exactly what you need, anywhere, at any time. * Fantastic solution to store jewelry, toiletry, makeup paraphernalia like lipstick, makeup brush, eye shadow, nail polish, eyeliners. All women's essentials in one elegant case. * Detachable part and divided section to keep all the necessities neat and in order. * Easy to Clean: Black Foamed oxford Insulate Lined for Easy Cleaning. * Great Gift Idea: Amazing gift for family, friends, co-workers, presentations, birthdays, holidays and more. 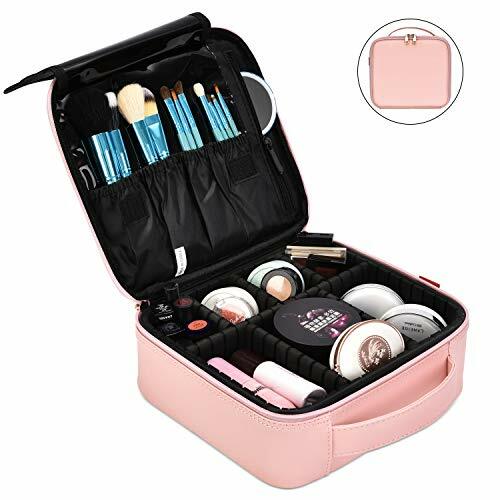 * Durable with water proof, shake proof, anti-wear and spill-proof interiors for long use Size: 10.3 X 9 X 3.5 Inches Weight: 1.6 lb What's in the Box: 1pcs of Travelmall Mini Makeup Train Case 2pcs of large pads (5 IN), 3pcs of small pads (2.6 IN), 1pcs of long pads(10 IN) Note: Cosmetic accessories not included in this item. Multifunction: Each makeup bag offers TWO Main Compartments, can hold your clippers, tweezers, eyebow pencils, brush or other grooming items in place. Doulble layer structure: 2 zippered layer with 3 separeted room to help keep your different makeup essentials organized. Second layer with a large storage space and a mesh pocket. Multiple compartments for various needs of storage. Mesh pocket for storing small and flat cosmetics. High quality Nylon Material: Nylon of product makes this travel toiletry bag extremely easy to clean if any drips or spills were to occur during your travels. 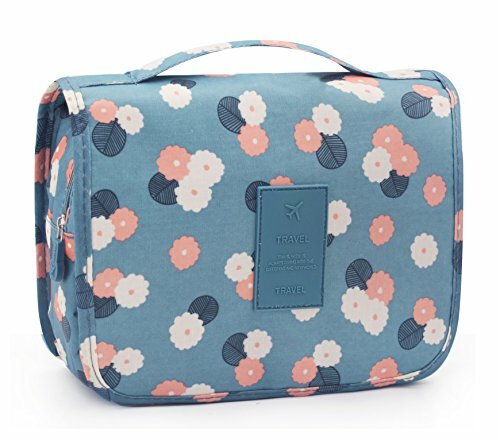 Easy to Clean: The waterproof oxford nylon outer material makes wiping spills off the toiletry travel bag a breeze & keeps dirt at bay to ensure the makeup bags remain in lovely condition. Size: 7.08in x 3.93in x 1.96in (18 x 10 x 5 cm). The one that started it all! The original, iconic Caboodle still features a spacious interior, removable accessory tray and a flip lid mirror. - Are you a workaholic with frequent business trips? - Are you preparing a family vacation or romantic honeymoon? - Are you tired of organizing a ton of your toiletries and taking time to find what you need from the mess! Innovative EPQUEEN Waterproof Portable Hanging Toiletry Kit Can Be Your Best Traveling Companion. High Quality Material: Thickened Polyester Fiber Mesh providing a safe and healthy environment. Exquisite Workmanship: The highest level of workmanship on the market,sloppy sew and bad zipper. Large Capacity: fit almost all your travel sized toiletries like shampoo, toothbrush & toothpaste, razor, shaving cream, conditioner, body wash, body oil, faces lotion etc. Perfect Structure: A total of 11 compartments and pockets keeps all your stuff Neatly Organized, Fast Spotting and Easily Access. Hock Design: The built-in durable hanging hook is convenient to carry or hung on towel racks, shower rods and door knobs. Wide Application: Can be used for vacation, business, gym, camping, bathroom organization, or even for dorm rooms. Risk Free: We provide 100% Satisfaction Guarantee, 30 days Free Return and 1 year warranty by sending replacement for any quality problem. MULTI FUNCTION - Multiple compartments for different requests of storage, strong long lasting round zippers. The bag will keep your cosmetic accessories safe, it's easy to access them, quicker and more convenient; folds up for easy storage and travel. Everything is easy to find. DURABLE MATERIALS - This Cosmetic Bag is Made of high quality water-resistant Thickened Polyester Mesh will protect your personal items and bring you a clean and comfortable trip. LARGE CAPACITY BUT LIGHTWEIGHT: Fit almost all your travel sized toiletries like shampoo, toothbrush & toothpaste, razor, shaving cream, conditioner, body wash, body oil, faces lotion etc. WITH HOOK AND HANDLE - The makeup bag is designed with one hook, convenient to be hung on the wall. Different sized compartments with mesh to keep the toiletries and cosmetics neatly organized. With the carrying handle you can take it with you at any time, ideal for travel, gym, outdoor activities etc. 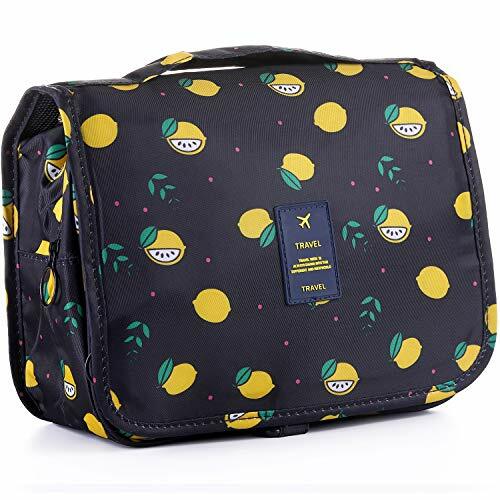 WHAT'S INCLUDED - 1x Toiletry Bag; Product dimensions: folded size: 9.5x7.8 x3.8 inch (24cmx20cmx9.5cm);unfolded size: 42cm x9.5cm. 100% Satisfaction Guarantee,Free return within 30 days.If you are not 100% satisfied with the packing cubes, simply return them for a full refund no questions asked. Dimensions -10.2" x 9.4" x 3.7"
It looks small, but in fact it is a lot of capacity, you can install a lot of things. Smart Design: You could rearrange the dividers to fit your needs and keep all of you cosmetics organized. and store other item in the bag. Easy to Carry: Lightweight and carrying with strong handle, or you could put it in your backpack and suitcase either. 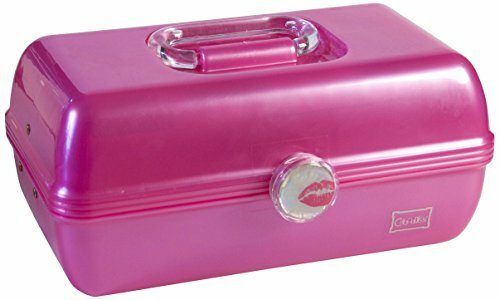 1 x Large makeup bag with sturdy handle. 1 x Pocket with zipper in the top. 4 x Slots for brushes in the top. Exterior: High density PU leather makes bags durable, water-resistant and easy to clean. Interior: Adjustable dividers surrounded by a removable HARD plastic keep the shape and provide excellent protection to cosmetics. Built-in foam: top and bottom are padded, shockproof. WARRANTY 30-Day money-back guarantee for any reason. 18-Month warranty for quality-related issues. For 18 months after the date of purchase,we take care of all quality-related issues with a REPLACEMENT OR FULL REFUND. Please allow tiny measuring deviation in normal range(1-3cm), because all dimensions are measured manually. slightly different from the photos. will disappear for several days use. Material durable high quality PU leather - water-resistant and easy to clean; Padded top cover and bottom - great protection; Removable sponge dividers - Smart; Golden top dual zipper - wide access. Smart Design You could rearrange removable sponge dividers to fit your needs. Dual zippers closure provides quick loading and easy access. Simple but creative cosmetic makeup bag. Fit All Your Need 10.2 x 9.4 x 3.7 inch, large capacity and interior could be divided up to 7 compartments, separate different type of your cosmetics, makeup tools, toiletry, jewelry and digital accessories. Portable Do your makeup anywhere, perfect for short trips, ideal for travel.The only thing you need to do is putting the bag into your travel luggage. You could also use it to store your cosmetics at home. Perfect choice as a gift. Warranty 30-Day money-back guarantee for ANY reason, and we take care of all quality-related issues with a REPLACEMENT OR FULL REFUND for 18 months after the date of purchase.We also provide lifetime customer service. Warranty is suitable for all colors. These travel cosmetic bags are made from good quality PVC waterproof material, along with large opening zipper on top make it easy to pack. 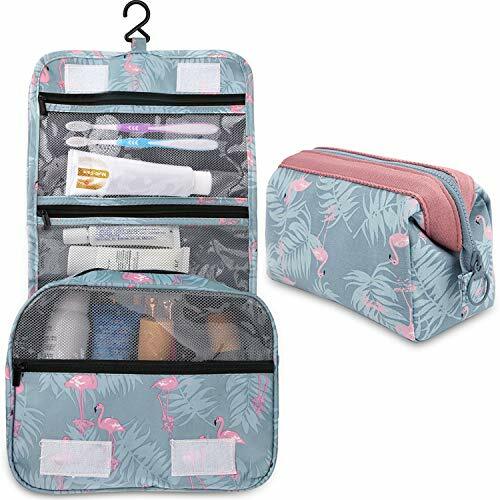 They are suitable for storage of wet items such as swimsuits and towels; Also great for storage your makeup toiletry items; The clear bag keeps everything is organized and clear at a glance, easily find what you are looking for without wasting time, good for use for home and travel. Compared to other bags that have excessive markings and logos that prevent easy viewing of your products, this displays only one necessary marking on the front face of the bag,so you and security personnel can clearly see what is in the bag and not have to open one after the other after the other. Transparent travel bag: transparent design allows you to see what is stored and where it is, easily find what you are looking for without wasting time. Good quality: made from durable and clear PVC material, along with large opening zipper on top make it easy to pack. IDEAL FOR TRAVEL - Great for work trips or holidays. Good selection of sizes for keeping hotel rooms & bedrooms tidy. Easy to throw one in your beach bag or napsack when you're on holiday or in your work bag when you are on the move. of procedures to ensure its excellent quality.If you take a look at our store items,you will see more fashion&attractive designs. Exterior PU Leather: High quality leather makes bags durable, water-resistant and easy to clean. Lining polyester: Excellent wrinkle resistance, elasticity and dimensional stability. Built-in foam: Under the top & bottom leather, provide excellent protection either. Humanity Design: You could rearrange the dividers to fit your needs and keep all of you cosmetics organized. Easy to Carry: Lightweight and carrying with strong leather handle, or you could put it in your backpack and suitcase either. New Bag come with material smell. Please do not worry about, just put the bag on an airy space for a while. Or the smell will disappear for several days use. NEW VERSION Material: Exterior durable high density nylon - Water-resistant and easy to clean. Pink polyester stripe lining - smooth and nice touch.Interior removable divider and extremely protective built-in foam - excellent protection. Dual zipper - wide access. Humanity Wide Open Design Humanity interior design - you could rearrange removable sponge dividers to fit your needs. Dual zippers closure provides quick loading and easy access. Simple but creative cosmetic makeup bag. Portable Do your makeup anywhere, perfect for quick trips and business trips, ideal for travel; You could just use it to organize your cosmetics/makeup at home. Perfect birthday gift for mother, wife, sister, girlfriend, daughter. Dimensions 10.2 x 9.4 x 3.7 Inches, great size and roomy enough to carry all your small travel essential. Specially designed for women and girls. Organizing and storing all your cosmetic. With a mirror inside, convenient for your make-up. Durable handle design, portable, great for travel or display on your home dresser. 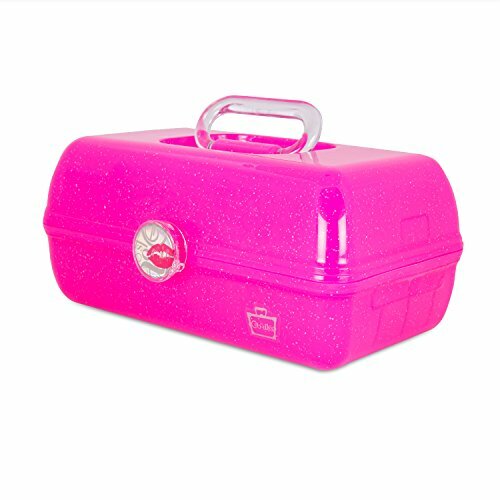 The "on-the-go-girl" Caboodles cosmetics case lives up to its name, with extensive organizational travel features. The case is a durable and simple organizational tool featuring a sturdy handle and trays that raise when the case is opened. The bottom of the case creates a large space to hold larger items like brushes, while the top of the case is a tray divided into 3 compartments to store items of ranging sizes. The lid on the large raising tray props open to offer a mirror on the underside, while a removable shallow tray protects you delicate brushes from damage during travel. With plenty of room left to spare, the "on-the-go-girl" case is the perfect mobile solution to maintaining your style anywhere. GREAT BRIDE GIFT The Bride bag set by Tri-Coastal Design is the perfect combo to shower your future bride with for that special day. This cute bag combo is not only adorable, but will help her stay organized on the big day. We know the wedding day is all about the bride REVERSIBLE Unlike many other bags on the market, our tote bags are completely reversible! Want your bride to have a cute "Bride" bag to hold all her goodies? We've got you covered. 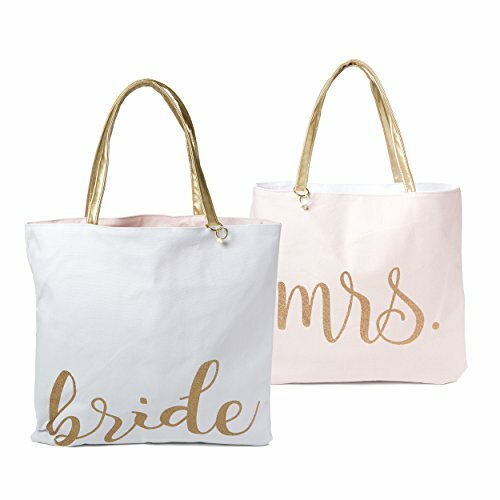 One side is all white with Bride in gold foil detailing; reverse to the other for an adorable light pink color with Mrs.in gold foil detailing.. MULTIUSE Most bridal party bags don't offer the functionality and versatility of the Tri-Coastal Designs bag. We made our easily reusable and reversible, so your bride doesn't have to let it collect dust in their closet after the wedding day. When the big day is over, your ladies can quickly reverse the purses to use as a daily bag, weekend farmers market tote or grocery shopping tote. 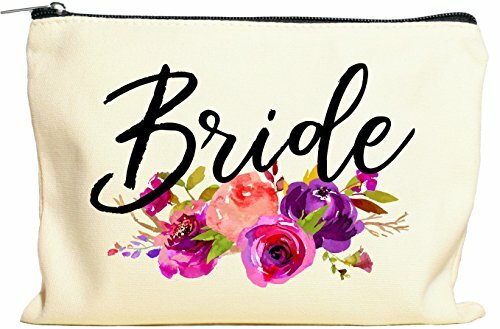 LARGE SIZE Measuring 16.5 inches by 16 inches, the Bride washable canvas tote by Tri-Coastal Designs is large enough to hold all of the bride's wedding day necessities, from hairspray and deodorant to wedding shoes, spandex tights and more. Moonwake Designs products are printed by us using the highest quality inks so that the makeup bags hold up against normal use. These bags are great gifts that are simple and standout. ABOUT OUR MAKEUP BAGS Size: 9.5 W x 7 H No gusset, perfect size for holding all of your beauty products! Color: Natural Beige, featuring a sleek black zipper with a silver pull. Material: 100% Cotton Canvas Care: Spot clean with mild soap and water. Image is professionally printed to ensure vibrant images. 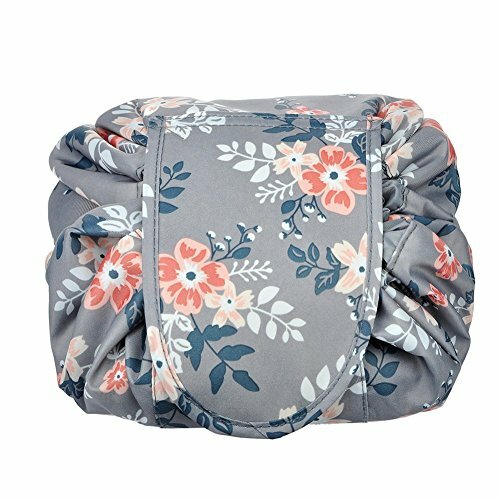 100% brand new and high quality The is the perfect item for every season all the year The cosmetic bag is specially designed to give you a style that will keep you fashion Each color is soft and comfortable Material: High Quality polyester(8.6''*5.3"*0.78") Report incorrect product information. Brand:NiceEbag 10-year experience in various bags,has been very picky from materials selecting to detail craftsmanship.Every bag you received has been through hundreds of procedures to ensure its excellent quality.If you take a look at our store items,you will see more fashion designs. Material Waterproof PVC.Durable and clear.Take it to the pool or beach, throw in a larger tote or travel bag & know your items are protected from moisture or sand! Easy to wipe clean. CLEAR AT A GLANCE.The transparent design allows you to easily see what you need and where it is. Structure 1 x Large clear bag with leather handle.Dimension (LxWxH): 12.5" x 5" x 8.5". 1 x Medium clear bag.Dimension (LxWxH): 9" x 2.3" x 6.8". 1 x Small clear bag.Dimension (LxWxH): 6.3" x 2" x 5.2". 1 x Medium leather bag.Dimension (LxWxH): 8" x 2.3" x 4.2". 1 x Small leather bag.Dimension (LxWxH):7.5" x 3" x 3.5". Warm tips New Bag come with material smell. Please do not worry about, just put it on an airy space for a while. Or the smell will disappear for several days use. Keep away from high heat, wipe with damp cloth. Made of Eco-Friendly PVC material, softer and more pliable, durable and reusable, waterproof and clear. Easy to see what you need and where it is. Compliant with TSA 3-1-1 rules and regulations of all airlines.Making the security process go more smoothly.Getting through airport security fast. 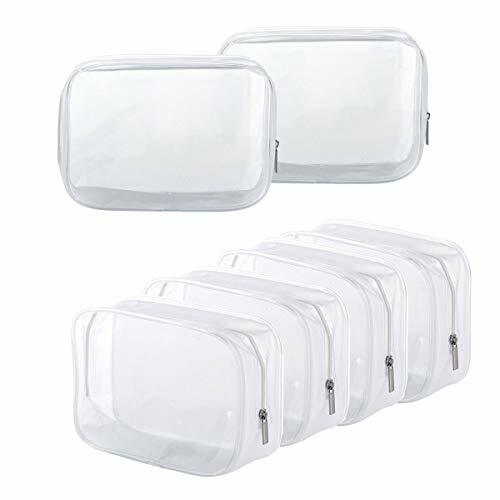 1 x Large clear bag with leather handle.Dimension (LxWxH): 12.5 x 5 x 8.5.1 x Medium clear bag.Dimension (LxWxH): 9 x 2.3 x 6.8.1 x Small clear bag.Dimension (LxWxH): 6.3 x 2 x 5.2;1 x Medium leather bag.Dimension (LxWxH): 8 x 2.3 x 4.2;1 x Small leather bag.Dimension (LxWxH):7.5 x 3 x 3.5. 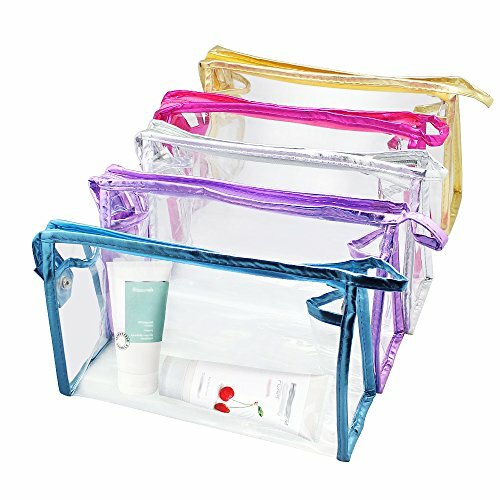 Maximize luggage space, travel organized, reduce mess with these small to large sized clear zipper travel pouches, perfect for cosmetics,toiletries,baby items,shaving kit,electronic devices,perfume,sunglasses,lipstick,facial cleanser,passport,school supplies like colored pencils,art or craft supplies and so on. 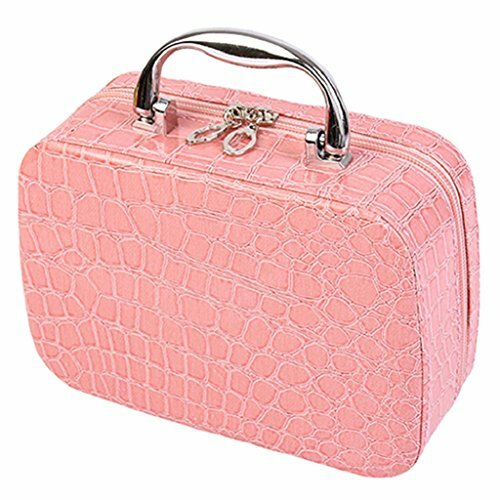 Used as Travel Cosmetics bag, Toiletry bag, Makeup organizer, Makeup artists travel bag, Top-handle strap for easy carriage. Large Capacity Multi functional storage bag. Drawing opening for easy access to your makeup items. It's the perfect choice for organization of your cosmetic tools. Do you want a energetic and fashion toiletry bag? Do you think the bulk travel toiletry bag will add the weight of your luggage? The Travel Portable Makeup Brush Holder made of water resistant nylon fiber and clear PVC, can be colsed with heavy duty zipper to keep brushes from dust, pet hair and other dirts. Large capacity to storage up to 24-32pcs brushes or pencils, saving the space for your bag and make it easy to travel with your cosmetics. 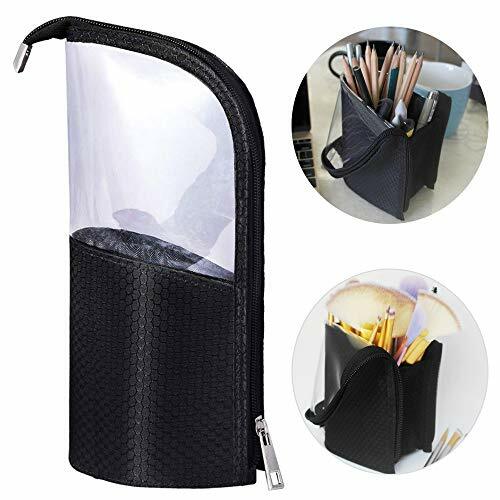 The pouch can be folded like a standing pen holder, and make it easy to find and use the brushes or pens. Features: 1.Portable Travel Case : lightweight, space saving, easy to carry, compact and make your cosmetics neat to store in your tote bags and suitcases 2.Daily Dust Proof: can be zippered up to keep the makeup brushes from dust, hair, pollens and other dirts. 3.Large Storage: big enough to fit up to 32 brushes, and tall enough for long brushes. 4.9 Elastic Separated Slots: elastic band slots can be used to organize and fix the makeup brushes. 5.Water-Resistant: made of water resistant fabric and the transparent PVC is easy to clean 6.Vertical Stand: flexible construction for ability to stand up on its own, easy to get the brush you need. Compact size with large capacity, 9 elastic band slots for fixing effect. Reduce mess and save space. Stress-free to hold a 24pcs cosmetic brushes set. Multi-functional Use: Can be used as makeup brushes bag / pencil pen holder. Standing on its own as a brush / pencil holder when fold down. Cup-like design for easy access. Eco-Friendly Soft transparent PVC, flexible hard shell covered with water-resistant nylon, durable, foldable, and easy to wipe clean. Perfect Travel Makeup Case: Portable and Lightweight design, with waterproof, anti-wear and spill-proof interiors. You can bring your cosmetics to anywhere. no worry about the wash bag and the toiletries get wet, keep everything clean and tidy. These travel cosmetic bags are made from good quality PVC waterproof material, along with large opening zipper on top make it easy to pack. Conveniently carry your personal shaving kit or cosmetics on the go. Keep your bottles, containers, liquids, shampoo, cosmetics, lipstick, electronic cords, sunglasses, stationeries, well organized. Keeps everything is organized and clear at a glance, easily find what you are looking for without wasting time, good for use for home and travel. 30 DAYS MONEY-BACK GUARANTEE - If you are not satisfied for any reason, pls feel free to contact us, we would like to do our best for you. 30 DAYS MONEY-BACK GUARANTEE - If you are not satisfied for any reason, please feel free to contact us, we would like to do our best for you. Get Your Permissions - LAKIBOLE offers Best Caring Service. Enjoy your purchase from LAKIBOLE. Any questions Just Contact us! Size: 42cm*30cm*12cm / 16.5" x 11.8" x 4.7" Unrivalled quality: Our bag will look just like new even after a long time use due to its durable and waterproof material. It is very suitable for travel, business trip or use at home. About the product * Delicate Looking& Workmanship. The tidy and fine close stitching ensure the Makeup Organizer bags are sturdy and durable. * You can Design Yourself internal compartments by the adjustable padded dividers. * Lightweight & Easy to Carry. Ideal for taking exactly what you need, anywhere, at any time. * Fantastic solution to store jewelry, toiletry, makeup paraphernalia like lipstick, makeup brush, eye shadow, nail polish, eyeliners. All women's essentials in one elegant case. * Detachable part and divided section to keep all the necessities neat and in order. * Easy to Clean: Black Foamed oxford Insulate Lined for Easy Cleaning. * Great Gift Idea: Amazing gift for family, friends, co-workers, presentations, birthdays, holidays and more. * Durable with water proof, shake proof, anti-wear and spill-proof interiors for long use. 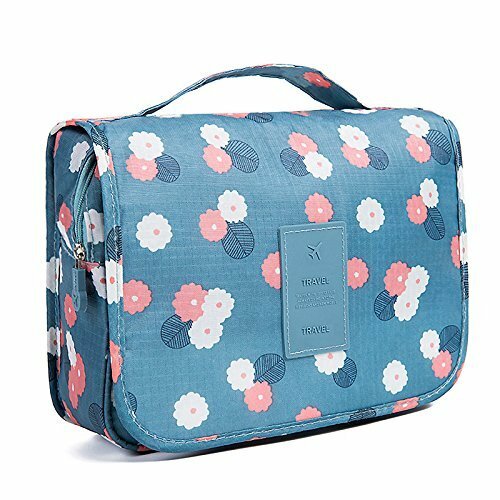 High quality Resistant Material and Easy to Clean: This Makeup Bag is made of high quality Oxford Fabric, Lining-nylon for easy cleaning. Wonderful gift ideas: Wonderful gift for family, friends, colleagues, birthdays, holidays and more. Roomy Size Help to Keep Everything Organized: Provide ample space to fit in women cosmetics makeup essentials like Airbrush, hairbrushes, makeup brush, lipstick, eye shadow, skincare products, shampoo, creams, nail art products, jewelry, toiletry, travel accessories or men's shaving kit. 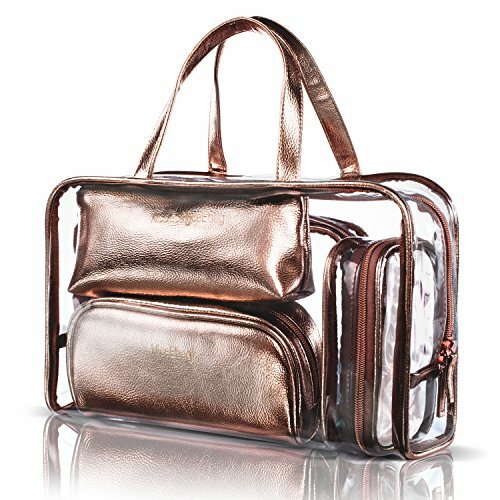 Attentive designed More Convenient than Other Train Case: With Large Mirror and Supporting Belt On Both Side add your Convenience in everyday use; With 2 layer specific layer for curling irons, Elastic for hair curler hair straightener, makeup brush etc, zippered bag and DIY space; Very popular among Both Professional Makeup Artists and ordinary people. DIY Space: Separable sections and segments to keep all necessities tidy and orderly. You can also design your own compartments with adjustable dividers. 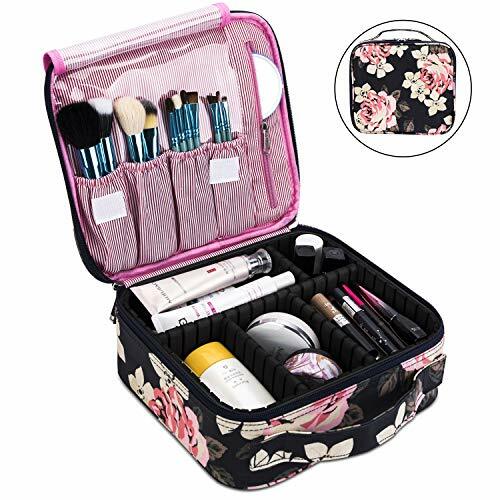 Multi Functional Perfect For Any Occasions: Personal makeup case organizer, professional makeup artist box, set it on the Trolley and never worry about the weight when travel around; Adjustable straps let you use it as should bag or a backpack. eyebrow pencil, makeup tools, etc. compasses, pencil sharpeners, rubber knives, etc. makeup brush holder. You only need to buy one bag to have two functions. to remove the stains, and you can easily find the items you want. Material: waterproof nylon + TPU"
MULTI-FUNCTIONAL STORAGE BAG: This bag is also very suitable for stationery. It can carry 35 pencils or colored pens. It is easy to carry with school bag, in school library and painting. GREAT DESIGN IDEA: This make-up brush bag can be carried anywhere and any time. It can be carry very conveniently when the use is over. 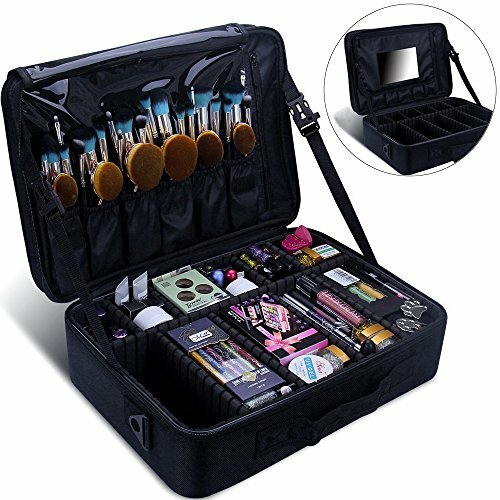 You don't need to buy a makeup brush case and a makeup brush holder two kinds product,only need one bag. EASYFUN focuses on developing all types of bags and creating products to help all those who carry things, in the most practical and stylish way. Your satisfaction is our greatest motivation. Size: 8.6" x 4.7"x 4.6" (L x W x H). 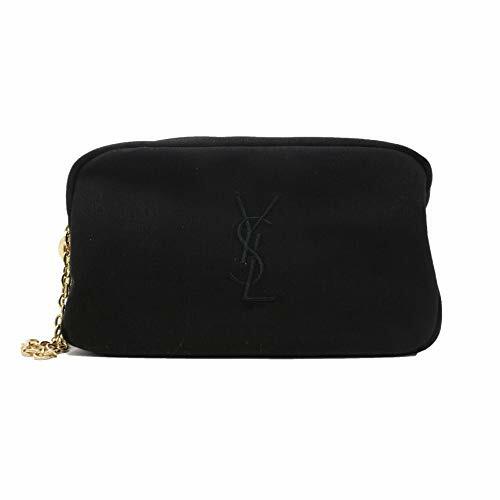 This travel makeup bag not too large, not too small have enough space to storage your makeup, like lipstick,lip gloss, makeup brushes, eye shadow, makeup palettes, hairbrushes, skin care products, nail polish, nail art tools and so no. 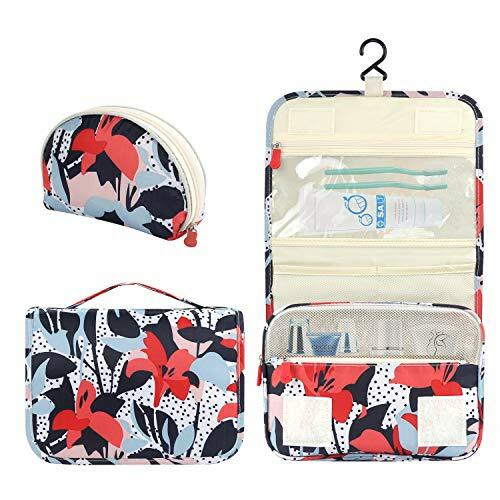 This makeup bagorganizer designs smooth and sturdy double zippers and highly stitchedtop handle strap, make it more convenient and safe to take. EASYFUN cosmetic travel bag is easy to carry by the top handle. In a pretty look, it is useful for various occasions no matter it is a family vacation, business trip. 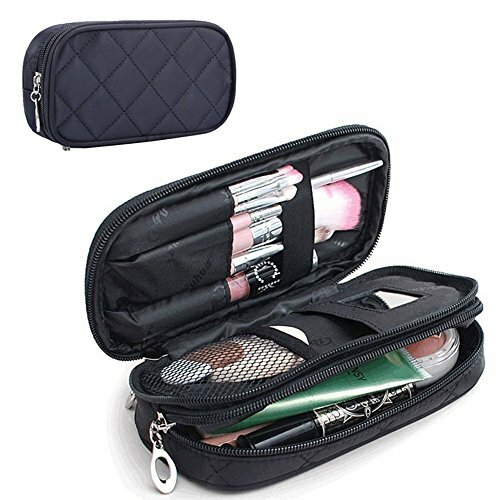 This cosmetic pouch have several compartments and makeup brushes slots, you can keep your makeup and makeup brushes are neat and tidy. Lifetime Warranty. Any problem about your small makeup bag, be free to contact us by e-mail.Your satisfaction is our greatest motivation. High Quality Nylon Material This makeup bag is made of high quality nylon and red lining with thick sponge. Nylon makes this cosmetic bag extremely easy to clean if any drips or spills occur during your travels. Also thick sponge gives more protection to your cosmetics. 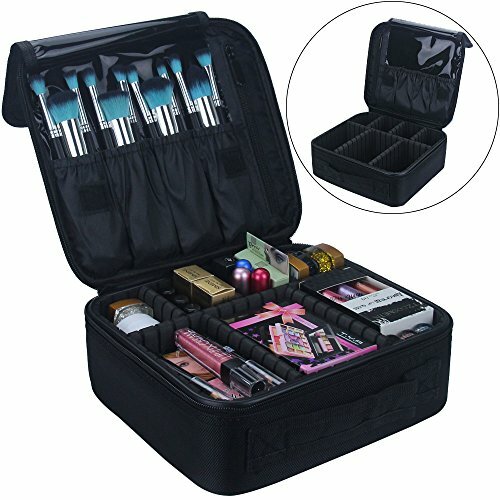 Fit ALL YOUR NEED Size:8.6LX4.7WX4.6H ( inch ) Our cosmetic organizer can hold all your makeup. 4 small brush loops on top are ideal for women's brush, mascara, eyeliner, and has plastic cover to keep them clean. The main compartment can storage cosmetics and skincare products. Also offer a detachable small mesh bags for lipstick, lip gloss. 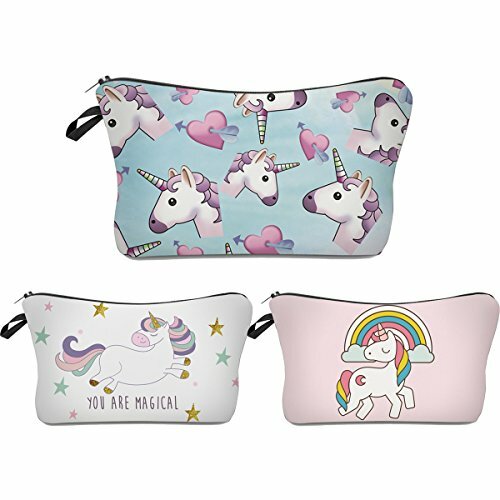 Perfect Makeup Bags for Women Portable and Lightweight design, with waterproof, shockproof, anti-wear and spill-proof interiors. You can bring your cosmetics to anywhere. 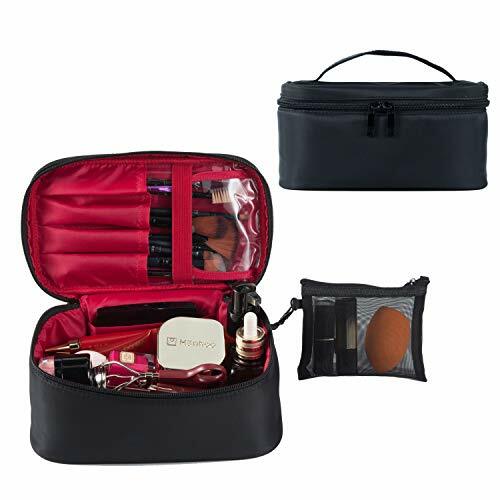 Multifunctional Makeup Case This black make up bag not only can storage your cosmetics, but also Jewelry, Electronic Accessories, Camera, Essential oil, Toiletries, Shaving Kit, Valuable objects and so. Lifetime Warranty If you are not 100% satisfied with our travel organizer, we offer you LIFETIME WARRANTY. If you have any problem about our cosmetic case, please be free to contact us by e-mail. We will get back to you within 24-hour.